Marat Bisengaliev and the West Kazakhstan Philharmonic Orchestra in Almaty, Kazakhstan perform “Zere: Part 1″ composed by Erran Baron Cohen. When the mockumentary Borat opened in theaters in 2006, it delighted in offending all sorts of people, mainly Americans. But Kazakh officials were also not exactly thrilled about the portrayal of their country. The film was banned in Kazakhstan, and the government launched an advertising campaign to salvage the nation’s battered image. In all the controversy, virtuoso violinist Marat Bisengaliev, saw an opportunity. “Finally, there would be an interest for people to find out about the real Kazakhstan,” he tells reporter Arun Rath. Marat went after the composer of the music for “Borat” — Erran Baron Cohen, the brother of the film’s star Sacha Baron Cohen. Erran had composed a mock Kazakh national anthem with the lyric: Kazakhstan’s prostitutes, cleanest in the region, except of course for Turkmenistan’s. The symphony was performed to critical acclaim in England, but Marat had been apprehensive about performing Erran’s work in Kazakhstan. Feelings were still raw, and some called him a traitor. But he agreed to present the piece if Sound Tracks would film it. How would people react? Can music ever make amends? Kazakhstan seems to have responded with good-humoured equanimity to the film Borat, in which Sacha Baron Cohen’s antics did not perhaps portray the country in the most favourable light. But as if to redress the balance, this concert brought the Turan Alem Kazakhstan Philharmonic Orchestra for a programme that showed a more cultured side of the Kazakh character. 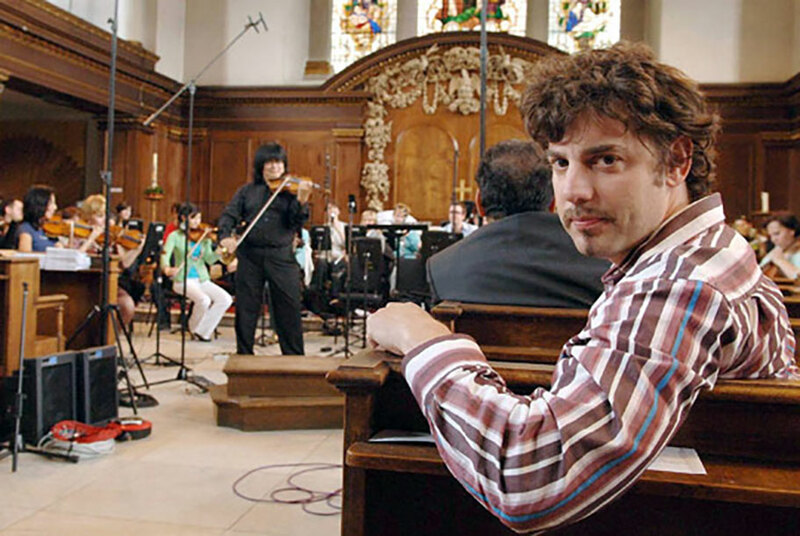 Given the wave of publicity and controversy that Borat generated, it was astute, not to say broad minded, of the orchestra to include a work by Baron Cohen’s brother, Erran, who also wrote the film’s soundtrack. Zere is a 20-minute piece of mood music, with the standard orchestra given an added tang by the use of such folk instruments as the domra and kobyz. To say this exotic colouring was the most interesting thing about the piece is perhaps to do it a slight injustice, but the three movements were fairly directionless, and from the point of view of style did not do anything that would have unnerved Vaughan Williams or Rimsky-Korsakov. The concert’s extended first part was largely given over to a succession of miniatures for orchestra and solo violin, played by Marat Bisengaliev, who is also the Kazakhstan Philharmonic’s conductor. These ranged from Kreisler’s Praeludium and Allegro, through Bazzini’s fiendish La Ronde des Lutins (one of Maxim Vengerov’s favourite encores), and on to such things as Albeniz’s Asturias and the Méditation from Massenet’s Thaïs. There was an element of the production line in the way all these were performed, one after the other, with slender characterisation and matter-of-fact virtuosity on Bisengaliev’s part, but the orchestra equipped itself well in Rachmaninov’s Vocalise and in a piece of quasi-Hindemith neo-classicism called Boston Winds for Strings by Almas Serkebayev. The major test was Haydn’s Symphony No 104. Let’s not pretend the Berlin Philharmonic need yet look to its laurels, but there was some good, honest playing here and a potential among these young players that one felt could profitably be tapped by conductors prepared to work hard on interpretation and finesse. Bisengaliev’s approach was not, frankly, the most searching, and the performance made no concessions to contemporary thinking on historically aware practice, but the ensemble was precise, the sound clear and the rhythms alert. Given time, the orchestra could, as Borat would have said, make benefit glorious nation of Kazakhstan. After Kazakhstan’s outraged official response to Sacha Baron Cohen’s Borat movie – which included a summit meeting with George Bush in Washington and an aggrieved cri de coeur in the press from the country’s UK ambassador – the last person who expected an invitation to compose music for a Kazakhstani symphony orchestra was Cohen’s brother, Erran. It’s not as if he can disclaim involvement in the satiric onslaught perpetrated by the racist, homophobic Kazakh TV reporter Borat, since it was Erran who wrote the score for Sacha’s uproariously offensive “movie-film”. Hence he was taken aback to pick up the phone and find Marat Bisengaliev, Kazakh violin virtuoso and conductor, on the line. “I was very surprised to get a call from Marat, and initially I thought it might even be a joke,” admits Erran, sipping peppermint tea in the seethingly hip brasserie of the Charlotte Street Hotel. He resembles Sacha, but with the hyperactivity turned down a bit. His new composition is entitled Zere, in recognition of sponsorship from Kazakhstan’s Zere Corporation, and will be given its world première at St James’s Church in Piccadilly, London, on Frida y (or at least its first three completed movements will). Bisengaliev will play violin and conduct the improbable-sounding Turan Alem Kazakhstan Philharmonic Orchestra. There are plans for additional performances in Kazakhstan and in Mumbai with the Symphony Orchestra of India, of which Bisengaliev is music director, while Sony BMG will release the complete version on CD. Even the composer isn’t sure what it will sound like played live by a full-scale orchestra, though he suggests listeners may detect his fondness for the likes of Steve Reich, John Adams and Górecki. Meanwhile Erran has been shuttling to Los Angeles in pursuit of more film work, and a fortnight ago won an award for his Borat soundtrack. Yet perversely, it doesn’t contain a single note of authentic Kazakh music. “The soundtrack covered a wide spectrum, but it was based on gipsy Romanian music,” confesses its composer. The Zere project is further evidence of the way official condemnation merely boosts Borat’s mystique. The Kazakhstan government banned the film and suppressed a satirical Borat website, but Kazakhstanis have been buying DVD copies by the armful. Now, Borat-related music may help to bridge the culture gap between Western Europe and a previously obscure country – albeit the world’s ninth largest – in Central Asia. “I think Sacha was very brave to make the film, and it was dangerous to make,” says Erran. In 16 years as a professional musician, Erran has learned the value of versatility. A trained trumpeter as well as composer, he has worked as a session musician, composed music for commercials, scored TV programmes from nature documentaries to his brother’s Ali G series, earned extra cash from teaching and formed his own band, Zöhar. The latter recently had their second album, Do You Have Any Faith?, released in the USA on Miles Copeland’s CIA label. “I love to fuse things together which are not obviously meant to be linked,” he says. Success seems to be a genetic trait in the Baron Cohens. Erran’s cousin Simon is a Cambridge psychology professor and expert on autism, another cousin, Ash, is directing a film in Hollywood, and his older brother Amnon designs computer chips. Zere will be performed at St James’s Church, London W1 on Friday.